RIGA, Latvia -- Justin Trudeau held the line Tuesday in the face of calls from Donald Trump for NATO members to increase their defence spending as the prime minister insisted Canada has no plans to double the amount of money spent on its military. 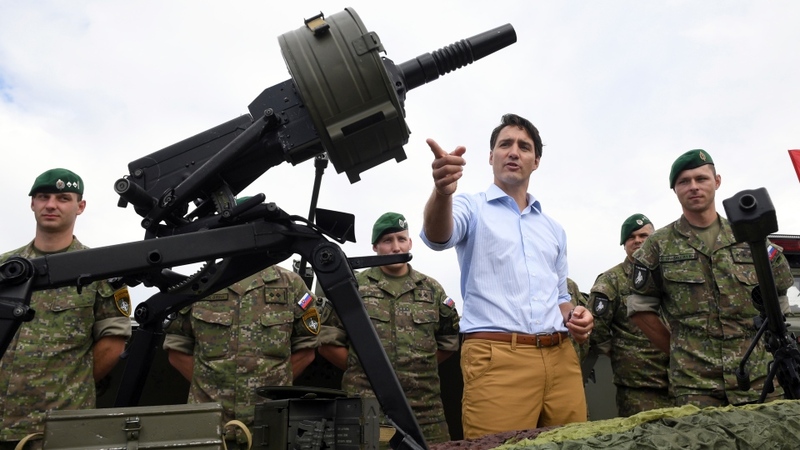 At the same time, Trudeau played down the weight given to an agreement made by all NATO allies, including Canada, in 2014 to spend two per cent of GDP on defence within the next decade, saying it's just one way to measure a country's commitment to the military alliance. The two per cent target, he said, is "an easy shorthand" but also a "limited tool" to measure a country's commitment to the alliance. The prime minister's comments came on the eve of what many expect will be one of the most contentious meetings between NATO leaders in the alliance's 69-year history, with Trump having put allies on notice that they need to pony up on defence -- or else. "Many countries in NATO, which we are expected to defend, are not only short of their current commitment of 2% (which is low), but are also delinquent for many years in payments that have not been made. Will they reimburse the U.S.?," Trump tweeted Tuesday. Canada hasn't been spared from the U.S. president's wrath. Trump sent a letter to Ottawa ahead of the summit expressing his "growing frustration" over the fact the two per cent target is still not being met by the majority of alliance nations. While the target was initially billed as aspirational, Trump and NATO Secretary General Jens Stoltenberg have seized on it as an important way to measure each member's commitment to the alliance. Indeed, four NATO countries have adopted laws or political agreements requiring the target be met. A new report released by NATO ahead of the summit predicted Canada would spend 1.23 per cent of its GDP on defence this year, a small increase from last year but still putting it 18th out of the alliance's 29 members. And while the Liberal government has promised to increase defence spending by 70 per cent over the next decade, its own figures project those investments will only raise total spending to 1.4 per cent of GDP by 2024. 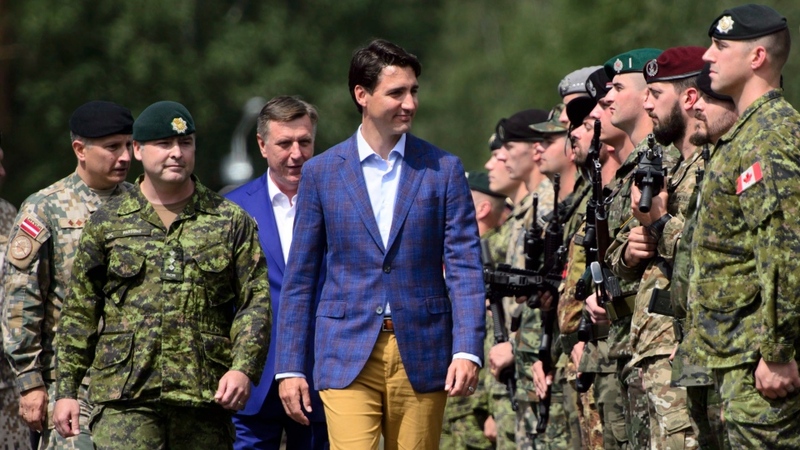 Trudeau played down the two per cent target during a visit with Canadian troops at the Adazi military base outside Riga, where they are leading one of four NATO battle groups tasked with deterring Russian aggression in the region. Trudeau said that while the two per cent target remains a legitimate way of measuring the commitment of alliance members, he considers tangible and consistent resources and leadership, which Canada continues to demonstrate, to be more important. "I think it's an important metric, amongst many others, to gauge how countries are doing in terms of contributors to NATO," Trudeau said. "That's a metric by which Canada can be extraordinarily proud." 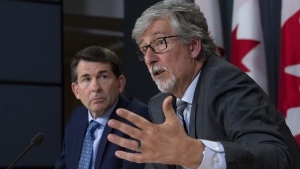 When asked directly whether Canada plans to meet the two per cent target, Trudeau said simply that there are no plans to double Canada's defence budget, which currently stands at around $20 billion a year. The prime minister's visit to Latvia on the eve of the leaders' summit sought to drive that message home as Trudeau announced Canadian troops would continue to lead the NATO battle group through 2023. The government is also adding about 80 more troops, bringing the total to around 530. Speaking in Brussels ahead of the leaders' summit that starts on Wednesday, Stoltenberg applauded Canada and European allies for having reversed years of cuts and investing more in defence while also contributing more troops and equipment to collective security -- even as he pushed back on suggestions the military alliance was in trouble. "My message is that we are actually now stepping up," Stoltenberg told reporters. "European allies are stepping up. Canada is stepping up. And we're also doing more together, North America -- the United States, Canada -- and Europe. And I'm absolutely certain that this summit will show that we are able to deliver on security, on defence despite the disagreements we see on trade and other issues." At the same time, the NATO chief said more needs to be done, and that Canada and its European allies "should not increase defence spending to please the United States," but because meeting the two per cent target is important for their own security and defence. "That's the reason why they agreed to invest more in defence back in 2014," Stoltenberg said. "The reason to invest is not to please the United States. The reason to invest more in defence is because it's needed because we live in a more unpredictable world." 2: Percentage of GDP that all NATO members have agreed to spend on defence by 2024. The target was established by alliance leaders in Wales in 2014 in response to concerns about Russian aggression. $27.6 billion: Amount of money that NATO expects Canada to spend this year on defence, based on a new method of calculating such spending that includes some veterans' programs and money spent on information networks. 1.23: Percentage of GDP that NATO estimates Canada will spend on defence in 2018-19, based on the new method of calculating such spending. $44.9 billion: Amount of money that Canada would need to spend on defence this year to meet the 2 per cent target. 1.4: Percentage of GDP that the federal government expects Canada to be spending on defence in 2024-25, based on the new method of calculating such spending. 5: Number of NATO members that are expected to reach the 2 per cent target in 2018. They are the U.S., Greece, Estonia, the U.K. and Latvia. 1.36: Median percentage of GDP spent on defence by all NATO members. 3.5: Percentage of GDP that NATO estimates the U.S. will spend on defence in 2018. 17: Number of NATO members who are expected to spend more of their GDP on defence than Canada in 2018. 10: Number of NATO members who are expected to spend less of their GDP on defence than Canada in 2018. -- with reporting from Lee Berthiaume in Ottawa.